I am in the middle of a conversation with myself as I am driving home: It’s been a cold winter this year! I think life is always a bowl of cherries, yes, but sometimes, no matter how we plan, wish, and dream, still certain things are out of our power and will occur in their own accord. It is as though we are standing on the shore, and these humongous waves come towards us. Sometimes they bring us treasures from the ocean, but, some other times, they take away what is so dear to us and what we are embracing so tightly in our arms. How insignificant yet how very significant each one of us are, a small stitch in this grand, tightly-woven tapestry of life. As I continue to drive, I also think of how fascinated I have recently been with Ruth Bader Ginsburg! 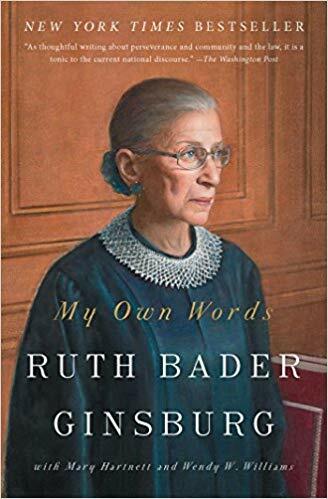 I have just finished reading her book, “My Own Words.” What an incredible woman she is, being one of the most influential justices, bringing gender equality to the spotlight, and standing strong for women’s rights and justice for all. Her life as a lawyer, her love of her family and opera, her style, her mind, her quiet confidence – everything is incredible. Kiki Ginsburg, as she is called by her friends and family, is a pillar of strength and courage. Reading the book, I was so very much in awe of her greatness. In the very beginning of the book, when she gives us a chance to look into and examine her childhood and reveals to her readers more of herself as a private person, I was excited to learn that I had successfully detected a well-hidden humanistic side of her. It was like, behind a heavy thick iron wall, I had discovered the evidence of feathers and silk. There are so many great women, whom in my mind I select to be my role models, and whom I wish to be just like when I grow up! These women have each come a long away, cleared the way, and made the blueprints of each of their journeys accessible to all of us. I want their road maps permanently pinned to the walls of every room of my house! I am so taken by who they are and how their lives have changed and have affected our lives. Can we ever thank them enough? I am at the end of the cul-de-sac now, driving into the garage of my home. 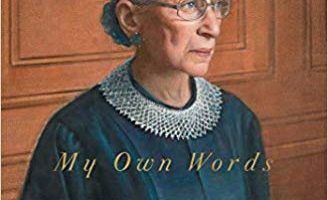 The train of my thoughts on this cold winter day is broken; my thoughts, which all have been running and tangling into each other – the thoughts of the trees, the thoughts of the waves by the ocean, and the thoughts of the amazing, incomparable Ruth Bader Ginsburg, my hero. I have to park my car now, thus, I interrupt the conversation with myself and say farewell to my thoughts until next time.